My mom bought these teeny tiny little grapes that are very cute, but they also happen to be absolutely delicious. Each little grape is as sweet as any grape can be, and very soft. You barely notice the skin on the outside unlike usual grapes. My mom said they are called champagne grapes. This is the first time I’ve heard of them. I’m guessing these are the type of grapes they use to make champagne (…hence the name…)? But I honestly don’t know for sure since I don’t know much about ’em. So these must be the grapes that they eat in those movies that we see, where the upper class Romans or the Egyptian Pharaohs are being fed grapes straight from the bundles. I discovered that’s the best way to eat these! 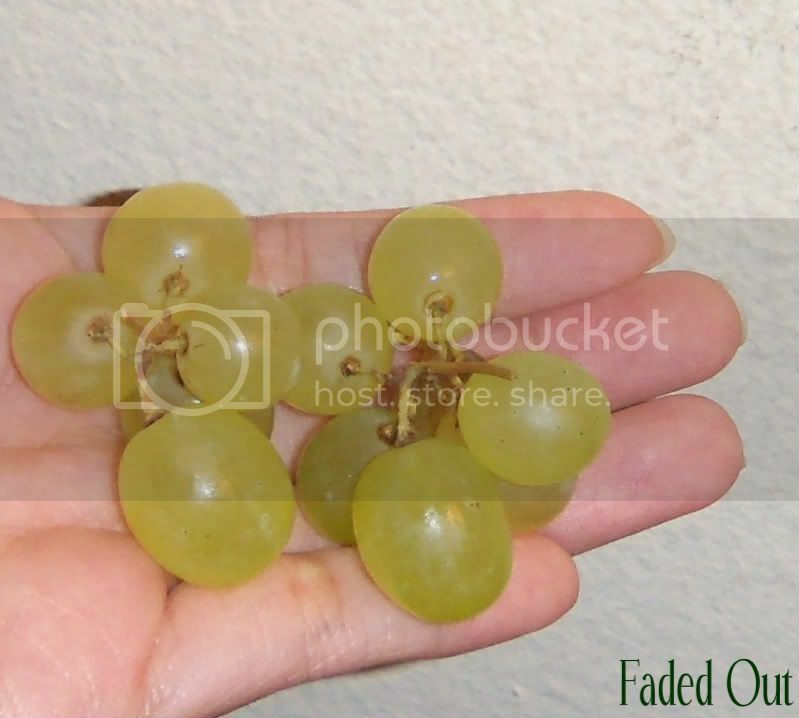 You grab a bunch, and just eat it like that, picking one small grape off of the bundle with your teeth. I added a picture of the grapes to show how small they are compared to my hand – and my fingers are quite small! i bought all the nail art supplies from ebay, most of them come from hong kong. i bought a few things, nail polishes,stamping planes, rhinestones, fimo, dotting tools and a few other stuff. Once i get all the packages i will take pictures and post then up this might take a few weeks though, i only got 4 packages so far and i need a few more. Ok, yup, you pretty much sold me at "You barely notice the skin on the outside unlike usual grapes." When I was little, I was kind of a diva, so much that my mom use to peel off all the skin of the grapes for me so I can just taste the inside when I first bite into it. Champagne grapes! I've heard of them, but never tried it. I love grapes, so I'm going to add it to my list. I've never heard of champagne grapes! I really want to try some now, haha. I never liked the skin of grapes, so I peel them off with me teeth but only when I really want to (AKA when I'm home alone and no one is around to make fun of me, haha).